Monel® studs, like Monel 400 and K500, are made from a nickel-copper alloy and exhibit high strength, toughness and good corrosion resistance over a wide temperature range. An outstanding characteristic of Monel studs is that they offer exceptional resistance to hydrofluoric acid, a particularly tough acid to deal with, in all concentrations up to the boiling point. 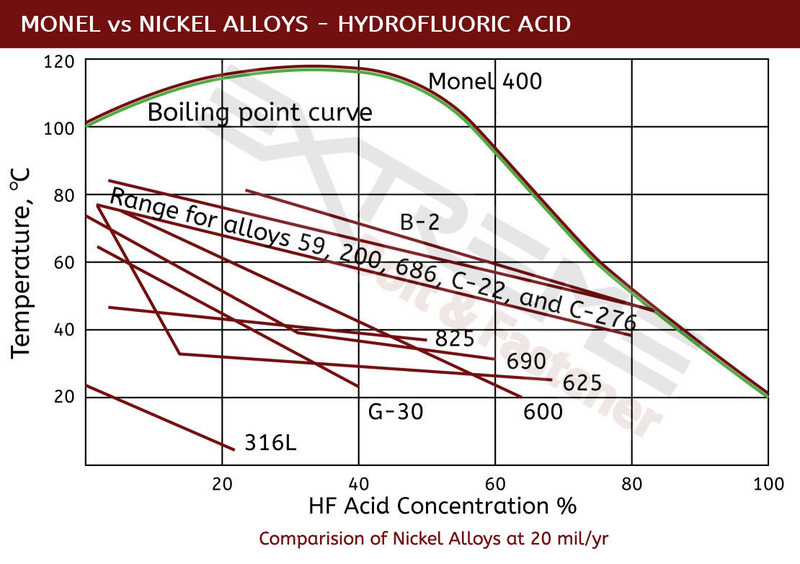 For hydrofluoric acid applications Monel studs are perhaps the most resistant of all commonly used specialty alloys. Monel alloy 400 & K500 studs also exhibit excellent corrosion resistance in marine applications and have reasonable corrosion resistance to sulfuric and hydrochloric acids under reducing conditions. Because of these characteristics, Monel studs are often found in marine and chemical processing applications. In addition to common Monel studs, we also offer Monel weld studs in Alloy 400. This specialty fastener provides a secure, cross-sectional weld in single-sided access situations. Inconel weld studs are available in a variety of fastener styles. The most common grades of Monel studs are Monel 400 and Monel K500 . Gain more insight on these two nickel alloy grades by accessing our Monel 400 and K500 overviews or by contacting our engineering experts. Monel 400, UNS N04400 (QQ-N-281), is a nickel-copper alloy with high strength and excellent corrosion resistance in a range of media including sea water, hydrofluoric acid, sulfuric acid, and alkalies. Monel 400 is commonly in marine engineering, chemical and hydrocarbon processing applications. Monel K500, UNS N05500 (QQ-N-286), is a precipitation-hardenable nickel-copper alloy that combines the corrosion resistance of Monel alloy 400 with greater strength (over 2x as strong) and hardness. It also has low permeability and is nonmagnetic to temperatures as low as -150°F (-101°C).